The temperature trend is going down, especially over the last 15 years. Temperatures go up and down from year to year, but the Earth is warming over the long run. Temperature records from around the world clearly show that the Earth has been warming since 1880. Those who argue it's cooling are either confusing cold weather with climate, or are referencing data that measure only short-term changes in global surface temperatures. Natural climate patterns like El Niño or La Niña can make the average global temperature fluctuate from year to year; that's why the lines on a global temperature graph zigzag. It also helps explain why short periods of cooling can occur within longer-term periods of warming. When scientists look at the big picture, though, a clear trend emerges: The world is warming. Temperature records from thermometers aside though, this reality is confirmed by the fact that ice sheets are shrinking, Arctic sea ice is declining, and the oceans are getting warmer. When looking for evidence of global warming, there are many different indicators that we should look for. While it's natural to start with air temperatures, a more thorough examination should be as inclusive as possible: snow cover, ice melt, air temperatures over land and sea, even the sea temperatures themselves. A 2010 study included 10 key indicators, and as shown in Figure 1, every one of them is moving in the direction expected of a warming globe. 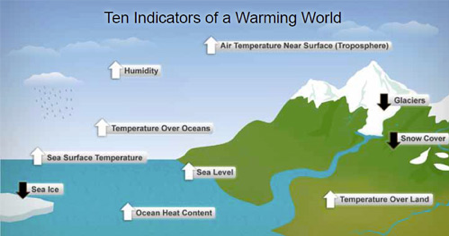 Figure 1: Ten indicators of a warming world. Source: NOAA. The question of global warming stopping is often raised in light of a recent weather event — a big snowfall or drought-breaking rain. Global warming is entirely compatible with these events; after all, they are just weather. For climate change, it is the long-term trends that are important, measured over decades or more. And those long-term trends show that the globe is still, unfortunately, warming.